Ryan Mathews returns this week for San Diego. Mathews participated in a full week of practice without any setbacks and should be ready for a full workload. The Chargers may give Mathews a series off in each half, but the Atlanta offense is the more likely limiting factor to his playing time. 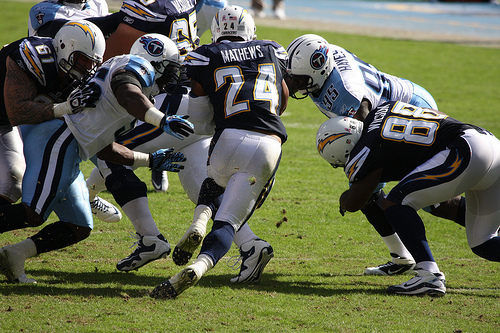 If San Diego can keep the game close, Mathews will get 20+ touches. Fantasy recommendation: Consider Mathews a RB2 with RB1 upside. Greg Jennings reportedly made significant progress late this week, increasing his practice participation on Saturday (though still listed as limited). The Packers are saying he’ll be a game-time decision, but it’s very unlikely he’ll play his usual number of snaps if he’s deemed ready to play. Fantasy recommendation: Though he has upside, Jennings is an extreme lineup risk. Consider him a WR3, but only if you’re desperate and have a viable hedge ready if he’s inactive. Steven Jackson is considered a game-time decision with what’s been reported to be a low grade groin strain. Jackson didn’t practice this week, though, and has a long history of multi-week muscle strains (groin, hamstring and quad) in his career. The Rams were cautious with him last week and I expect them to be cautious with him today. Even if he’s active, he’ll be heavily rotated with Daryl Richardson and there’s a high risk for an in-game aggravation. Fantasy recommendation: Sit Jackson today whether he’s active or not. There’s too much risk for the limited upside. Brandon Lloyd has been limited by a thigh injury all week. There has been no discussion about the nature of Lloyd’s injury and very little commentary on Lloyd’s availability in the local media this week. Lloyd may play every down, but it’s a big risk waiting until late this afternoon for more information. Fantasy recommendation: I think Lloyd is a relatively safe WR3, but I’d feel much more confident using him if I had a hedge like Sidney Rice or Randall Cobb or James Jones or Anquan Boldin. Antonio Gates was a surprise inactive in Week 2, but practiced fully Thursday and Friday and is expected to play today. There’s always a risk of aggravating a rib injury, but the two consecutive full practices are very reassuring. Fantasy recommendation: Start Gates as your TE1. Marques Colston didn’t look fully healthy last week and the Saints chose to rely heavily on Jimmy Graham and Darren Sproles against Carolina. Colston may continue to have difficulty separating against Brandon Flowers. Unless the Saints use him in the slot more with the expected return of Devery Henderson, Colston may again see relatively few targets. Fantasy recommendation: The matchup at home against Kansas City is too good to bench him, but consider Colston a WR3 at best until we see him turn the corner with this injury. Jamaal Charles reportedly has a bone bruise that’s unrelated to his ACL recovery. Even if that’s accurate, the two could become related quickly if Charles alters his gait and running style. There’s no reason for the Chiefs to overuse Charles with Peyton Hillis available. 10-15 touches are possible for Charles, but are also his ceiling expectation. Fantasy recommendation: Charles is a boom-bust RB2, though he’ll have more upside in PPR leagues if Dexter McCluster is inactive. Kenny Britt should now be ready to take a near full complement of snaps. The Titans may continue to ease him back slowly, increasing his participation to 40-50 snaps, but I think this is now a situation akin to what Marshawn Lynch and Trent Richardson were in during Week 1. If Britt feels good and is effective, he’ll play nearly every down. Fantasy recommendation: Use Britt as a very high upside WR3. Austin Collie successfully made it through three consecutive full practices without any recurrence of the symptoms which halted his progress in Weeks 1 and 2. We haven’t yet heard whether the independent neurologist has cleared him to play today, but I expect we’ll see Collie active. If Collie starts, expect the Colts to heavily rotate Donnie Avery into the mix opposite Reggie Wayne. Fantasy recommendation: Use Collie only as a desperation flex today and until he assumes the large majority of snaps. Colin McCarthy is out again this week with what I believe to be a high ankle sprain. I think it’s unlikely we see him next week and Week 5 is also in doubt. Will Witherspoon will continue to play middle linebacker (and in subpackages), with Zach Brown on the weak side. Fantasy recommendation: Witherspoon and Akeem Ayers are borderline LB2 today and have a extremely attractive matchup (at HOU) in Week 4. Both should be rostered and started. Jeremy Maclin will not play today as he continues to recover from a hip pointer and hip flexor strain. The location of some hip pointer injuries can limit the success of painkilling injections and any altered gait could set Maclin up for an aggravation of his flexor strain or lead to another soft tissue injury. The extra week of rest gives Maclin a good chance to return for Week 4, but expect him to be limited with the hip pointer for at least another week. Fantasy recommendation: Maclin’s practice status next week will guide your lineup decision next week. Consider him questionable until he proves otherwise. Jason Avant likely starts, but Damaris Johnson may well see more targets. If you’re looking for an upside WR3, Johnson is an intriguing risk-reward play. Pierre Garcon will not play today and has made little progress – if any – in the two weeks since injuring his foot. The reported location of the injury (midfoot) still worries me and makes an extended absence (another 1-2 weeks or more) possible. Fantasy recommendation: Don’t drop Garcon, but make arrangements for him to be out for another 1-4 weeks if you haven’t already. Against a struggling Cincinnati secondary, watch the pregame reports closely and be ready to start whichever Washington WR seems most likely to play the majority of snaps as your WR3 this week. Erin Henderson has been ruled out with a concussion. Marvin Mitchell will start at weak side linebacker, with Curtis Brinkley expected to assume Henderson’s subpackage snaps. Both changes are significant downgrades for the Minnesota defense. Fantasy recommendation: The matchup against San Francisco is strong enough to consider Brinkley as a LB3 / flex play. Rashard Mendenhall won’t play this week. Despite the confusing practice reports to the contrary, I think Week 5 has always been the target date for his return. Expect the Steelers to integrate Mendenhall into the offense slowly and continually re-evaluate his progress. The play of Jonathan Dwyer (and, to a lesser extent, Isaac Redman) this week and in practice next week will determine how many touches Mendenhall will get as the season progresses. Fantasy recommendation: Mendenhall is a smart pre-emptive pickup as a potential RB2 for the second half of the season. Rolando McClain hadn’t yet been cleared for a full practice by Friday and Dennis Allen couldn’t say whether he’d be cleared to play today. If McClain sits today, Travis Goethel will start at middle linebacker, but I would expect Miles Burris to take McClain’s nickel snaps. Fantasy recommendation: Make sure you have a late game hedge if you’re planning to start McClain today. Both Phillip Wheeler and Miles Burris are LB3 options if McClain doesn’t go. Dustin Keller has been ruled out this week, but his limited practice participation on Thursday and Friday could be a sign that Keller is getting closer to a return. Fantasy recommendation: The Jets could use a viable option between the hashmarks and in the red zone, so hold Keller if you have the roster space. Carlos Dunlap fully practiced this week, a sign that he could be ready to assume the extended role the Bengals have planned for him. He may not play 50+ snaps today, but expect him to start and see all the nickel snaps. Fantasy recommendation: Dunlap is a boom-bust DL2. Bernard Scott returns this week for Cincinnati. With BenJarvus Green-Ellis running very effectively, don’t expect a major rotational role for Scott. Every third series is his ceiling today. Fantasy recommendation: Scott may yet become a viable flex play, but he should remain on your bench (deep leagues) and waiver wire (shallow leagues) until his touches increase.